The United States is now the only country in the world not committed to the carbon reduction goals announced in Paris at the COP21 climate change summit in 2015. But that doesn’t mean all Americans have abandoned the fight. At the COP23 climate conference in Bonn, Germany, last week, more than 100 people from the US were present, representing 20 states, 110 cities, and more than 1,000 corporations that have banded together to create an organization called America’s Pledge, co-chaired by California governor Jerry Brown and former New York City mayor Michael Bloomberg. 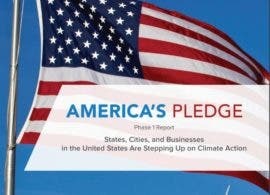 The combined economic power of the states and cities involved in America’s Pledge would make it the world’s third largest economy. California, Oregon, and Washington have joined hands to create the Pacific Coast Collaborative, which is working to “reduce greenhouse gas emissions, decarbonize the economy, and build thriving sustainable communities through the adoption of clean energy policies, sharing of expertise and resources, and collective action,” according to a press release. The group, which includes the Canadian province of British Columbia, was formed in 2008 to coordinate the climate change policy initiatives of all four members. Since its founding, area GDP and job growth have surged while carbon pollution has been cut significantly, proving that responsible action to address climate change does not mean a shrinking economy, as conservatives reactionaries suggest. The performance of the members of the Pacific Coast Collaborative gives the lie to the torrent of pro fossil fuel messages that spew forth from the many front groups and alleged “think tanks” propped up by money from the Koch brothers and fossil fuel companies. To counter that concerted and coordinated disinformation campaign, America’s Pledge released a report at the climate summit last week detailing precisely what steps its members intend to take to combat climate change. “The group of American cities, states, and businesses who remain committed to the Paris Agreement represents a bigger economy than any nation outside the US and China,” Michael Bloomberg told the conference. “Together they are helping deliver on the promise of the agreement and ensuring the US remains a global leader in the fight against climate change. In Paris, the US pledged to measure and report our progress reducing emissions alongside every other nation. Through America’s Pledge, we’re doing just that, and we’re going to continue to uphold our end of the deal, with or without Washington,” he said. Referencing the recent National Climate Report, which found that human activity is solely responsible for all global temperature rise since 1950, Governor Brown said, “What we’re doing is relatively limited to an existential threat that we face. We need to do more.” Which is precisely the message climate activist Bill McKibben delivered at the COP 23 conference last week. With virtually every part of the federal government now headed by stooges of the fossil fuel industry, state and local action is the only avenue open to people of good conscience who wish to stave off a climate emergency — an emergency that threatens nothing less than the extinction of the human race along with most of the plants and animals currently on earth. Now that the US government has been fully and completely corrupted by fossil fuel money, America’s Pledge and the Pacific Coast Collaborative stand alone in opposition to those who would happily kill us all in order to fatten their own wallets. The lunatic fringe holding the United States hostage has seized power by pursuing a divide and conquer strategy designed to fracture the populace into smaller and smaller pieces. It is within the realm of possibility that such divisions will result in significant segments of the country disassociating themselves from the union. The PCC and America’s Pledge may present a hint as to what a new political realignment might look like.